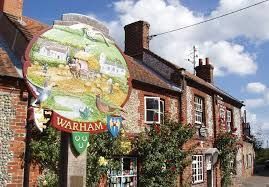 Warham is a small attractive inland village with flint and cobble cottages, which is less than 3 miles to the glorious North Norfolk coast at Wells Next The Sea and Holkham and 5 miles to the stunning nature reserve at Blakeney. The Norfolk coastal path runs through Warham with a stunning section of the walk through Warham marshes to either Morston or Stiffkey. It has an excellent local pub called The Three Horseshoes which is renowned for its Norfolk ales and traditional home-made food. To the south of the village, overlooking the river Stiffkey, are the remains of an Iron Age fort called Warham Camp, which is one of the best examples of an Iron Age Camp in the whole of England. Warham also has a request stop for the Wells and Walsingham Light Railway on which you can enjoy the nostalgic and atmospheric sights, sounds and smells of steam travel. Clanking over and under bridges, past a hill-fort and an abandoned platform, you get to choose between a stroll around historic Walsingham or the hustle and bustle of the beach and shops of Wells. There are bus services running through Warham serving Wells, Fakenham, Hunstanton, Holt and Cley. 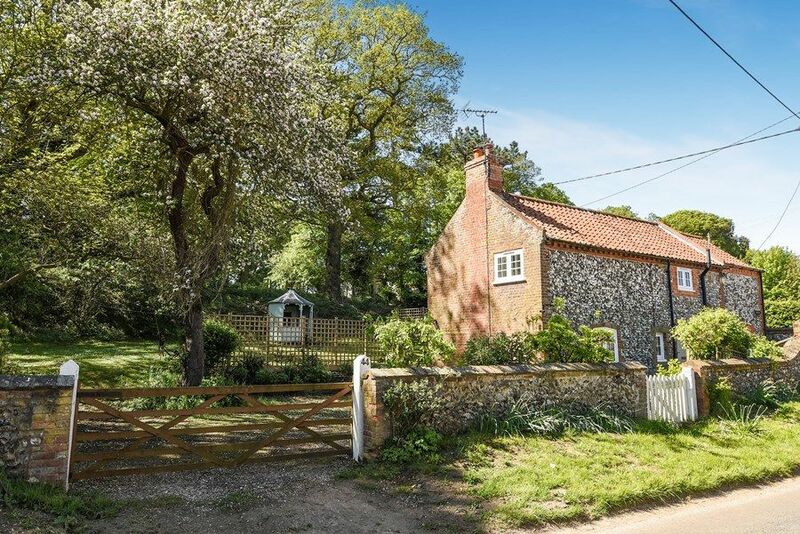 Apple Tree Cottage is a quintessential Norfolk flint and brick cottage dating back to 1860, which has been refurbished for 2018 including new furniture and re-decoration throughout. It has a lovely, large fully enclosed garden which is mainly lawned, and looks onto the picturesque medieval village church (one of 2 in the village; both worth a look). It is conveniently situated in the heart of Warham, opposite the highly acclaimed newly renovated Three Horseshoes pub, and within less than 2 miles of the beautiful coast at Wells Next The Sea and the stunning walk at Warham marshes. Bridge Farm Barn is a delightful spacious barn conversion with a wealth of original features including heavily beamed ceilings. It is well-maintained by its owners. There is plenty of space for couples and families to enjoy, with a charming sitting room with a full height window overlooking the garden, together with a second sitting/study room with a TV. The lovely beamed kitchen is well-equipped, with Bosch appliances, and a kitchen table for six. Six guests may sleep in comfort in two downstairs bedrooms (sharing a ground floor shower room) and a gorgeous upstairs master bedroom with adjacent bathroom. Outside there's ample off-street parking and a large fully enclosed garden with lovely views over open countryside. It's quietly located in the pretty village of Warham, within walking distance of the excellent Three Horseshoes pub and only 2 miles from the coast at Wells-next-the-Sea. Owl Cottage is a lovely brick and flint cottage which makes a contemporary holiday home. Downstairs has been opened up to create an open plan kitchen/living area with doors opening onto the garden. Upstairs there are 3 comfortable bedrooms and a bathroom, making this a perfect cottage for a family or 2 couples. It is quietly located in the village of Warham, backing onto Holkham estate land with lovely open views, only minutes walk from the local pub and less than 2 miles from the beautiful coast and the stunning walk at Warham marshes. The bustling coastal town of Wells-nest-the-Sea is only 5 minutes drive away. Tucwel is a much-loved detached Norfolk family holiday home, peacefully situated with far reaching open countryside views, within 2 miles of the beautiful North Norfolk coast. This spacious house is perfect for all generations with plenty of living space including a newly created open plan kitchen and dining room, a large living room and a second smaller sitting/games room. Upstairs there's a charming master bedroom with en-suite shower room and a further three newly decorated bedrooms and a family bathroom. The lovely well-established lawned gardens overlook open countryside, with the advantage of a safe enclosed garden for children and dogs. It is conveniently situated in the picturesque village of Warham, a short walk away from the highly acclaimed Three Horseshoes pub, and within 2 miles from Wells-next-the-Sea and the stunning walk at Warham marshes. Please note these are draft details awaiting confirmation by the owner. Photos will be available by the end of April.